I like to think that I am in the camp of cook once, eat twice. Or three times. Sometimes four. Quite often, we’ll cook a big batch of food on Sundays and use it to make weeknight dinner prep a little quicker. The other night, I was really wanting some chicken thighs. I figured if I was going to fire up the Egg to cook a few chicken thighs, why not use up all the available real estate and fill it up? I figured I could find something to do with the extra chicken, even if it just became lunches during the week. It does make prep easier, but it is also cheaper to buy the larger packs of meat. Cook it all and save it for later, or vacuum seal it and freeze it for later. Using all the available real estate. I could have fit a few more on there, but the package only contained nine. 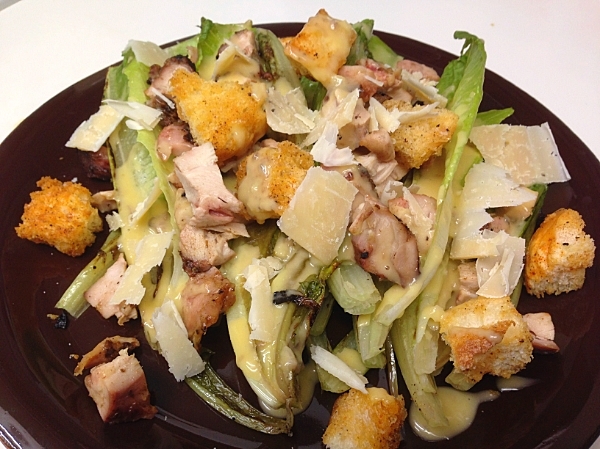 I decided that my first use of leftover chicken would be Grilled Chicken Caesar Salads. A quick, easy and healthy weeknight dinner for sure. We’ve done these in the past and really enjoyed them, but I realized I hadn’t shared them with you guys. You can take the easy route and opt to use bottled Caesar dressing, but you really should try to make the dressing by yourself just once. It’s really worth it. I guarantee. And you probably have all the ingredients on hand. Well…probably not the anchovies, but they are like $3 a tin and there is enough to make two batches. 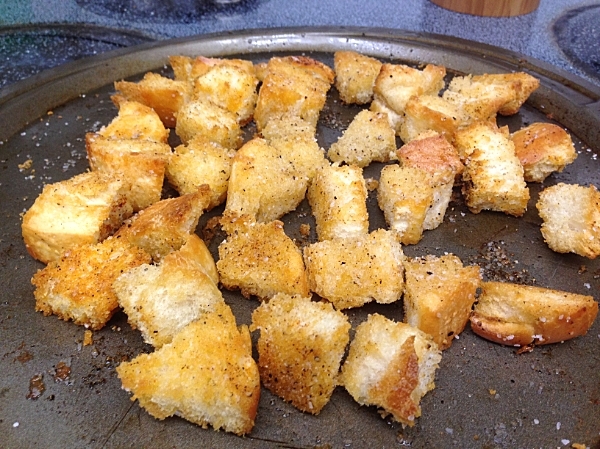 If you are going through all the trouble, make some home-made croutons as well. It only takes 10-15 minutes. I’m not sure what recipe Mrs. G has used for the dressing in the past and when I asked her about it, she couldn’t remember either. So I asked around on a few forums and took Kristi’s advice from Necessary Indulgences to use the one from Bon Appetit. Well…as much as I can follow directions anyway. It got a few tweaks. Romaine lettuce grilled direct at about 450F. Tear your bread into 1″ cubes. Toss the bread with about 3 Tbsp of olive oil on a baking sheet. 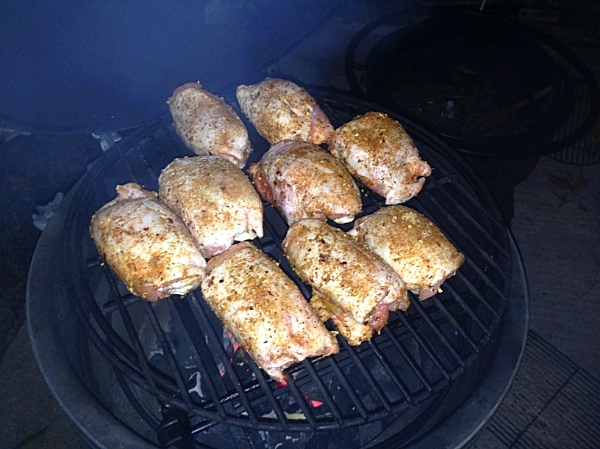 Season with Kosher salt, fresh ground black pepper and a touch of cayenne. Bake for 10-15 minutes, tossing occasionally, until golden brown. Chop together 6 anchovies and one clove of garlic. Add a pinch of Kosher salt and using the side of a knife blade mash into a paste. Scrape into a medium bowl. Whisk in two egg yolks, 2 Tbsp fresh lemon juice and 1 tsp of Dijon mustard. Slowly whisk in 2 Tbsp of olive oil, then 1/2 cup of canola or vegetable oil. Whisk until dressing is thick and glossy. Whisk in 4 Tbsp of freshly, finely grated Parmesan cheese. Season with Kosher salt and fresh ground black pepper if needed. Pour the dressing into a mason jar so that you can easily shake it up right before serving. Can be stored in the fridge up to one week. Slice the romaine lettuce in half. Drizzle with olive oil and sprinkle with Kosher salt and freshly ground black pepper. 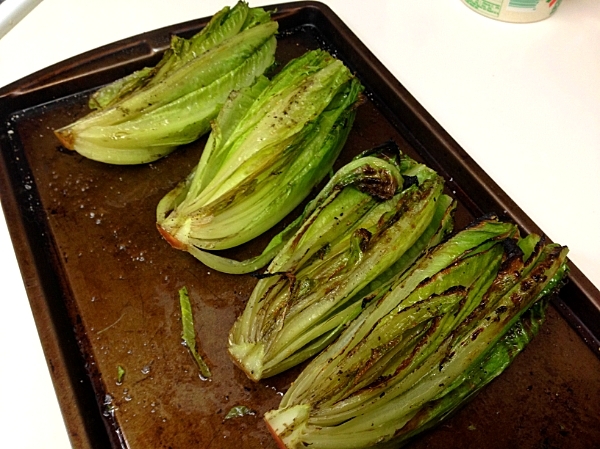 Cook the lettuce cut side down for about 2 minutes or until lightly charred. Remove the lettuce from the grill and either prepare your salad immediately, allow to cool at room temperatures or even chill slightly. You can either prepare your salad immediately after it comes off the grill, allow it to cool a bit or even chill it slightly in the fridge. We like to let ours cool a bit on the counter before building our salads. Take the romaine lettuce and slice off the bottom (sediment collects here as the lettuce grows and is hard to clean off while it is whole). 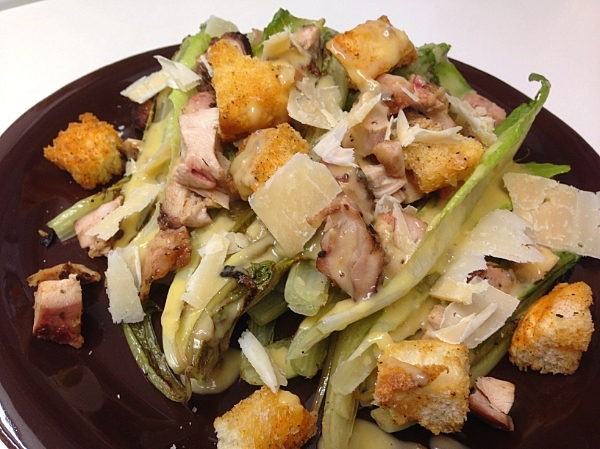 Arrange the lettuce on a plate and top with chicken and croutons. Drizzle on the dressing and then shave Parmesan cheese on top. Who knew a salad could look so good? What a quick and tasty weeknight meal this was. 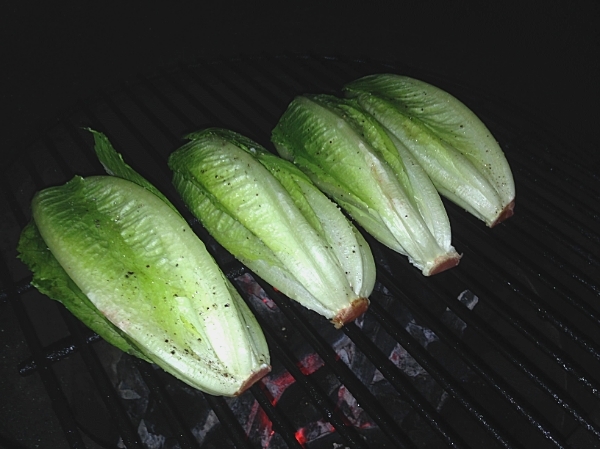 You may scoff at the idea of grilling lettuce, but have you ever done it? The smoky flavor adds another level of depth to the romaine lettuce. Topping it off with home made croutons and grilled chicken elevates it even more. Bottled Caesar dressing? Please. One taste of this simple and easy to prepare dressing and you will never buy it again. The citrus flavor from the lemon. The hint of brine from the anchovies. Like taking in a breath of ocean air. I’m not afraid to admit that I took a hunk of bread and wiped the bowl clean after transferring the dressing to a mason jar. Yes, it was that good. I think this will be going into our rotation much more often now. We have never grilled lettuce, but I can see what you mean about the smoky flavor. Grilling it probably also helps to set the salt and pepper flavors into the lettuce. I would also like to put in a recommendation for True Natural Taste, which makes the best dijon mustard I have ever had (http://truenaturaltaste.com/organic-mustards/organic-dijon-mustard/). They also sell a jalapeno mustard that is out of this world — great blended with mayonnaise as a dip for just about anything. Jason – believe it or not we’ve been drilling our caeser salad for several years right here in Story. Fixed it for your parents and Geoffrey fall of 2012 when I was down there taking care of grandma. Love it and we also top with toasted pine nuts instead of croutons. I need to pull out your cookbook again, Aunt Patty. Would you mind if I shared any recipes that we like out of it? Don’t mind me, I’m just over here licking my screen. Just before serving, vigorously toss the lettuce, cheese, chicken, croutons and dressing (you probably won’t need to use all the dressing) in a large salad bowl.